The Echinoblog: Starfish or Sea Star? Asteroid? 5th Anniversary Post!! Starfish or Sea Star? Asteroid? 5th Anniversary Post!! thanks to Paul G. for the photo! Greetings! 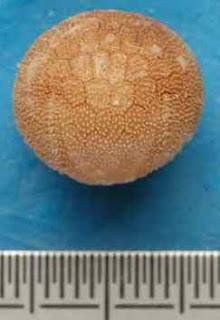 Today for the FIFTH ANNIVERSARY (began April 9th, 2008) of the Echinoblog a special topic! One so controversial and so earth shattering that it will pit Friend vs. friend! Sibling vs. sibling! Spouse vs. spouse! Mentor vs. student! A topic that has found bitter and vicious debate at museums, aquariums, marine biology and even paleontology programs around the world! I speak of course, of the dreaded "Starfish or Sea star (seastar)??" controversy! Which common name should we use for these frequently encountered and familiar marine animals??? But where to start? Let's define some terms, so this discussion doesn't get completely out of hand. Let us make no mistake-when we talk of this debate that we speak of members of the ASTEROIDEA. Starfish/Sea Star is a term that VERY SPECIFICALLY refers to the ASTEROIDEA-one of five living classes within the phylum Echinodermata (the others include sea urchins, sea cucumbers, crinoids, and ophiuroids). It is incorrect to refer to OPHIUROIDS as "sea stars" or "starfish", per se. Ophiuroids are an altogether DIFFERENT class of animals from asteroids. Go HERE to see some characters that tell them apart. Common names of ophiuroids include: brittle stars, serpent stars, basket stars. I find it acceptable that certain echinoderms are referred to as "XXXX stars" under certain circumstances. A separate class of echinoderm-the Crinoidea (lacking a stalk), for example are often called "Feather stars." I'm cool with that. The specific terms "sea stars" and "starfish" should only be applied to ASTEROIDS. Here we go.. Asteroid vs. Starfish vs. Sea Star!!! There are THREE, Latin-based, English terms- as outlined below: "asteroid" (from the scientific name Asteroidea), "starfish", and "sea star." This discussion comes up over and over..and seldom seems to find resolution... Here then are a list and discussion of these terms and the back-and-forth over the terms.. These reflect various arguments I have heard/collected over the years. While I have my conclusions at the bottom...please feel free to take these different perspectives to your classrooms, aquarium education courses, and grad school discussion groups to discuss at your pleasure! Yell at me in the comments if you wish! 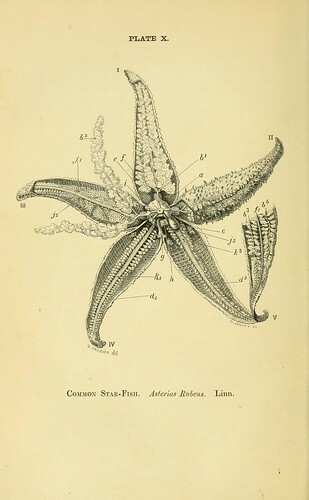 The latin name from the group, ASTEROIDEA was officially put to paper by the noted French zoologist Henri Marie Ducrotay de Blainville in 1830 from the Greek aster and eidos referring to "star (as in the sky)" and "form or likeness." Nouns are derived from the scientific name.. so "asteroids" is technically the proper term for animals that we would refer to as "sea stars" or "starfish". The Main Argument against: No, we can't use the term "asteroid" because it might be confused with a giant space rock hurtling through space! OH NOES! Arguments FOR using the term starfish! 1. The word starfish is widely used and "I" like it. So why change what ain't broke? Google recovers 13, 200,000 hits relating to "starfish"including use in religion, politics, obscene rock lyrics, hitting the bed and splaying out on the surface, charity organizations, nuclear bombs, and yes, sometimes it even refers to animals! 2. So what if the word is a misnomer? Plenty of words in the English language are inaccurate. Greenland is icy and Iceland is green! Sea horses aren't horses! Why can't we just put up with one more? That's life! C'est la vie! 3. Starfish is the oldest known western term. (thanks to John Lawrence, at USF for the info) According to the Oxford English Dictionary (OED) this dates back to 1538 referring to "Stella, a sterre, also a sterrefyshe. "(from Elvot, dic.) This usage corresponds to the first definitiion given for "fish" in the OED: "In popular language, any animal living exclusively in the water"
These days of course, our terminology has been much revised based on tons of evidence showing classifications among animals and we acknowledge that "fishe" had a much different meaning 475 years ago, but the term has stuck with us and its not likely to be going away anytime soon. Arguments against the term starfish! Starfish are NOT fish! 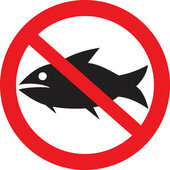 The term is inaccurate since any MODERN definition of "fish" refers to proper vertebrates and NOT invertebrates! Inaccurate terms are SO confusing! 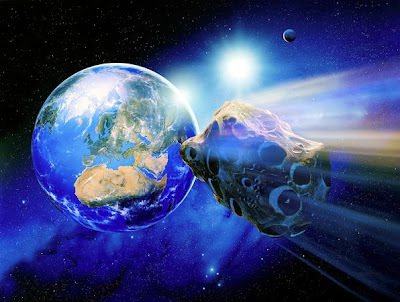 People and students who have not had basic biology will not know that asteroids are NOT fish! Oh Noes! Arguments for using the term sea star (or seastar)! 1. The term is more accurate. Asteroids aren't true fish so why call them that ?? (other than historical tradition, which is dumb!). 1. The term Sea Star gets less use than Starfish. "Seastar" (one word gets 2,660,000 hits) but note that "sea star" (two words gets 475,000,000 hits-but many of these may be random combinations of "sea" and "star"). Its dumb that we use such a wishy washy word that other countries use! 2. Sea Stars are not stars. Asteroids may not be "fish" but nor are they big burning balls of space gas! I once used the "sea stars are not stars" thing jokingly-but it turns out, the reference to stellar bodies has a real basis! 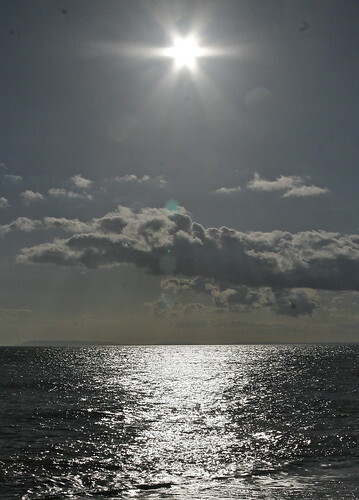 The FIRST definition for "sea star" in the OE dictionary (and indeed Websters as well) (date uncertain) is of a "star which guides mariners at sea", the Star of the Sea, with only the SECOND definition referring to proper asteroids. 3. Asteroids are not always star-shaped! Sometimes they are pentagonal...almost to the point of being round..
Other times flat and almost paper-like.. In the 90s (or thereabouts) there was a huge revolution in educational programs across museums and aquariums throughout the US, and inevitably beyond. Many of the various common names ended up getting names that people felt were more accurate. So jellyfish were called sea jellies. Hagfish were called sea hags and so on. At about the same time was the big "political correctness" revolution from the late 80s, early 90s which was intended at diffusing offense and infusing more respectful terminology among public and political dialog-with extensive changes to almost all terminology. Here is a full workup of that scene at Wikipedia. Naturally, it was widely assumed that common names in science had befallen the same fate. 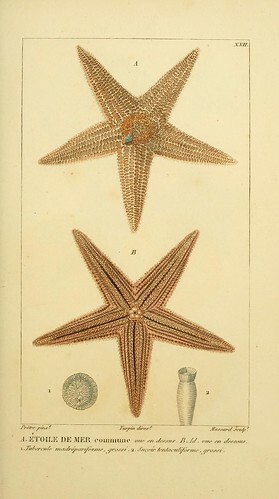 But as indicated above.. the term "sea star" has been around since the 1700s. And across different languages. And since, ultimately, asteroids DON'T really care WHAT you call them, it does seem unecessary to apply political correctness to echinoderms. Are European terms the only one we should consider? At a certain point in this discussion it becomes readily apparent that the "common name" argument for asteroids emphasizes the western/English terms. Do terms for starfish in other languages offer more attractive options? Let's look at a few! *hitode (ヒトデ). This word means "palm" in Japanese. 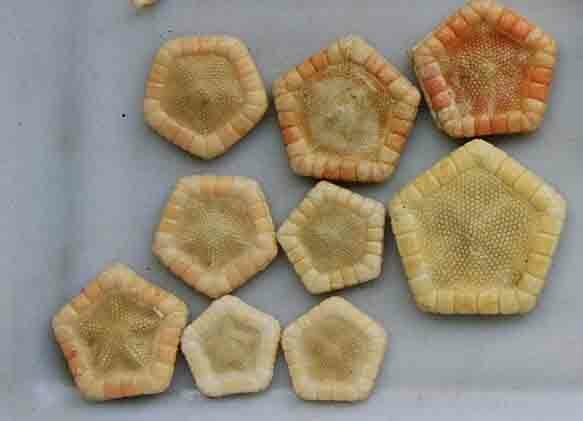 Here is a post I wrote about Japanese starfish names! Records of the term hitode date back to 1712! *tapak sulaiman.In Malay, this word literally translates to "Solomon's Footprint"! Snazzy, eh? *불가사리 In Korean, the word for starfish refers to "Immortality"!!! These are all awesome. and hmm.. Solomon's Footprint is a pretty cool name for an asteroid! Ultimately, though these terms seem to work out best in their homelands where the cultural context makes the terms more useful (and perhaps less confusing in English). Although I dunno... I'm still kinda fond of Solomon's footprint..
What was the oldest name again? Within the international rules that dictate proper scientific names for animal species, it is generally accepted that the OLDEST term has seniority over the others. But these rules generally only apply to the proper Latin species names and not the "common" or popular names. So, they don't necessarily apply. But as far as established 'legal' criteria goes this is one of the few which exists, so it should be considered. "Starfish" is the senior name.. Finish it up! I ain't got all day! 1. Asteroids are starfish/sea stars. NOT ophiuroids (aka brittle stars). I often see a wide variety of individuals in the popular arena apply the terms mistakenly. That is improper use and thus, is disapproved of. Hrrumph!! Double Hrrmumph! PLEASE STOP IT! 2. The term "asteroid" is technically correct. As indicated above, this is a NOUN based on the actual scientific name of the animal? HERE YOU GO. 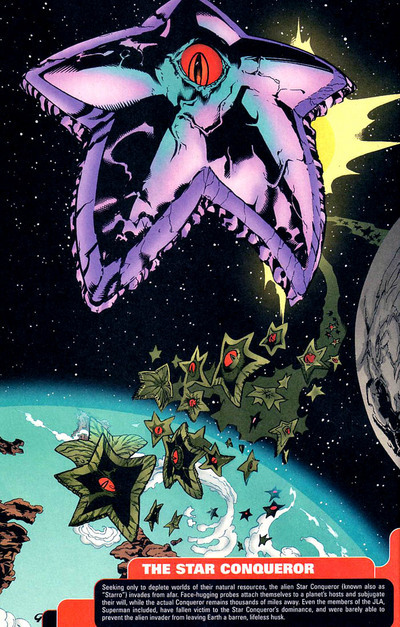 But of course, we could still confuse a big space rock with a giant interstellar starfish. I prefer to use "asteroid" as a scientist of course, but barring that? WHY NOT USE ALL THE TERMS? Many languages have different words for the same thing. I accept that there are different words with the same meaning. I trust context to decide usage. I tend to use "sea star" around students and/or an audience that might not be familiar with asteroids. I use "starfish" around people who know better.. and I use "asteroid" among my colleagues..but obviously there is interchange. person 1: We can't use "asteroid" because we could confuse it with a space rock! Oh NOES! person 2: Okay. Let's use starfish instead. person 1: We CAN'T use starfish because people would confuse it with a FISH! We MUST use sea star. person 2: Sea star! Pfah! weak. Why be conformist? Plus they are not burning balls of hydrogen! Bark! Bark! We shall use starfish!!! Its traditional! And sounds better! person 1: NO! SEA STAR! IT LESS CONFUSING! person 3: SEASTAR! BUT WITH NO SPACE BETWEEN THE WORDS! everyone: Oh NOES! TOO CONFUSING WITH Space Rock! HAPPY 5th ANNIVERSARY from the Echinoblog! On semantic grounds I'd say that starfish is the "least-bad" common name: it may be taxonomically inaccurate, but at least doesn't imply that these animals are celestial entities. On the other hand, does anyone still take "sea star" to mean "star that guides sailors" or whatever? I don't think so. It also has the advantage of being potentially more understandable to speakers of (some) foreign languages. 1. It's not as popular as "starfish". OK. I guess I can't argue against that one, but I'm generally not the sort that accepts the argument that I should like something because it's popular (see most Top 40 music of the last twenty years or so). Furthermore, "popular" clearly doesn't necessarily mean "correct". For one example, Googling "octopi" returns 1.3 million Google hits. Now, how about the term that pretty much every cephalopod biologist on Earth uses for the same group of critters (i.e., the term that isn't based on an incorrect assumption that "octopus" was originally Latin; http://grammarist.com/usage/octopi-octopuses/) -- octopuses? About 700K hits. 2. Sea stars aren't stars, just like starfish aren't fish! 3. Asteroids are not always star-shaped. It seems to me that any argument that invalidates the use of "sea star" because they aren't actual stars also (further) invalidates "starfish", which are neither stars *nor* fish. I will stick with the term that is only once wrong rather than twice wrong. Checkmate, Dr. Mah. Check. And. Mate. I hate to be a jerk but the colours you use on your blogs are BLINDING. I'm always excited to read about echinoderms but then I get so frustrated trying to read your fluorescent text that I ultimately, give up and ignore your blog updates. I suspect you'd have a lot more regular readers if you made your blogs a bit easier on the eyeballs. And why Dr. Anderson do you reject asteroid? Dear Blinded by color person! As luck would have it the 5th anniversary also had involved an overhaul of the template which had been the same for the last 5 years and required an overhaul anyway. Still some bugs..but i hope the new format is easier to read. thanks for your comments! I prefer seastar for this group. I find it less misleading for the scuba divers and young water enthusiasts I try to interest in the marine sciences. I really enjoyed this post - thanks for the fun and informative read. I shall continue to sit on the fence by using both. Congrats on your fifth anniversary - love the new Echinoblog look! Thanks! Always happy to hear a satisfied customer! I've heard many people teach children that "sea star" is the correct term, instead of teaching them any of the myriad wonderful things about the animals. It has become a pet peeve of mine, so I make a point to always say "starfish". P.S. I love your blog! Finding out about predatory brittle stars a while back made my month. I had never heard of the terms sea star or seastar until I read them in my kindergarten curriculum. Now I'm very cofused as how to introduce them to my kindergarten class. Perhaps I might have to call them something different yet to create more confusion.